The Sogn region spans the inner reaches of the great Sognefjord, the longest and deepest fjord in Norway stretching over 200 km inland to the foot of the west Jotunheiemen mountain massive of Hurrungane. 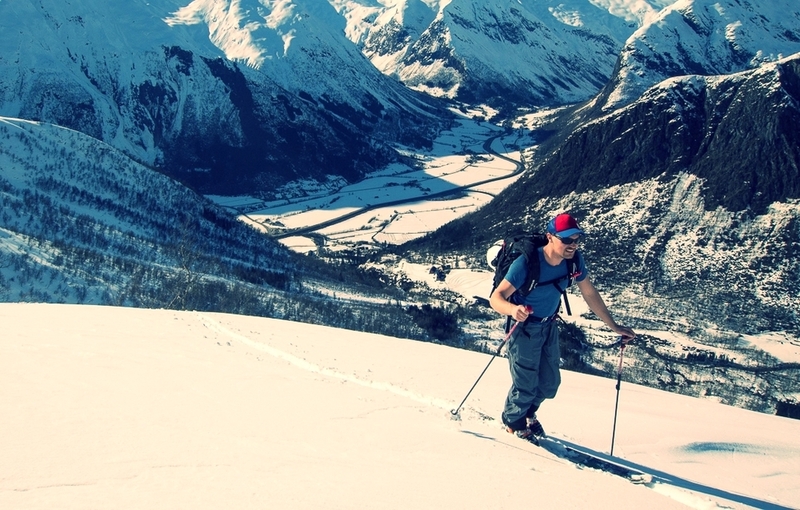 Surrounded on all sides by mountains, fjords, glaciers and a labyrinth of valleys creating numerous micro climates this region has all the ingredients for a fantastic and varied ski touring destination. The mountains here rise between 1200 m and 1700 m providing enough ski challenges for everyone from wide cruising flanks for the novice ski tourer to steep gullies for the most experienced. The best plan when ski touring in this region is not to plan, or do as the locals do, “where it snows tonight, we ski tomorrow”. 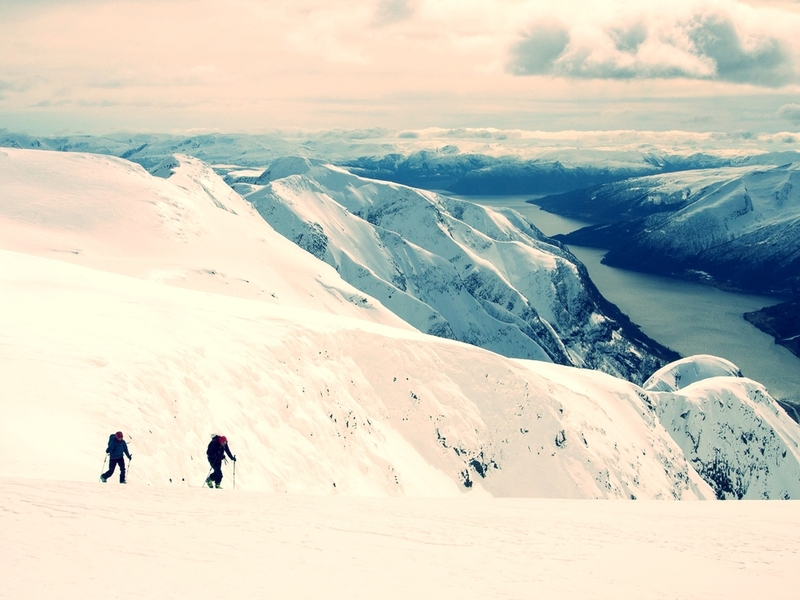 The multitude of valleys, flanks, orientations and elevations means there is nearly always fresh snow somewhere and with a guide to help you find it Sognefjord will provide a truly unforgettable ski touring experience. In these parts they use the term “laussnø”, literally “lose snow”, to describe all forms of unprepared snow that’s not hard crust and in the Sogn region they have more than enough of it to go round. When compared to other ski touring destinations in the world the Sogn region is the sleeping giant that’s only just beginning to stir. The Sogn region has a “laussnø” season three times as longs as Japan’s north island, snow depths to compare with Canada’s west coast and accessibility that makes Alaska seem like the back of beyond. The close proximity to mainland Europe’s largest glacier, Jostedalsbreen (Jostedal Glacier) makes the snow light and dry and extends the season into late June on north facing gullies. Add to this a thriving student population, the Mountain Sports Festival, ice climbing, glacier walking and fjord kayaking it’s no wonder the region is fast getting a reputation as an adventure lovers paradise. Our base in the region includes the intimate Fjærland Fjordstove Hotel on the shores of Fjærlandsfjorden, locally renowned for it’s high quality cuisine using only the best seasonal produce for the main ingredients.